Since 2007, the Sean Kelly Tour has taken place on the last weekend of August. 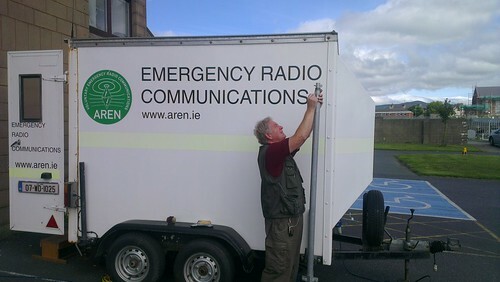 This year AREN was asked to assist Waterford County Civil Defence with locating the head and tail of both the 90k and 160k events to allow for efficient and effective ambulance deployment. EI2GN, EI3ENB, EI7IG, EI5GOB and EI8JA turned up on the morning, and quickly set about the task. As the mobile command post was being set up, APRS was deployed into the sweeper vehicle for the 90k event, however the 160k sweeper had already left so a plan was formed to intercept the 160k sweeper later in the day, and EI3ENB, was dispatched to a food station to carry items to a Civil Defence ambulance already deployed to that station. Below are a series of screen shots (from Xastir) depicting the progress of the event during the day. Screenshot 1, EI3ENB en-route to Clonmel, and the 90k Sweeper is visible just outside Dungarvan. Screenshot 2, EI3ENB is in Clonmel, EI8JA is heading to Rathgormack to let us know when the head of the 160k arrives there. 90k sweeper is nearing Bunmahon. Civil Defence Officer is at the Tramore foodstop. Screenshot 3, 90k sweeper is almost in Tramore, EI8JA is in Rathgormack. Screenshot 4, CD Officer has moved to Rathgormack, EI8JA has moved to Mahon Falls, EI3ENB has taken up station at the tail-end of the 160k and is acting as a sweeper. Screenshot 5, EI2GN has gone to relieve EI8JA at Mahon Falls, 90k sweeper has left Tramore. Screenshot 6, EI3ENB reached Rathgormack, 160k sweeper was located and an APRS tracker was quickly installed in his vehicle. EI3ENB then headed for home. CD Officer has moved to Mahon Falls. Screenshot 7, 160k Sweeper has passed Mahon Falls, 90k sweeper has almost reached Dungarvan. Screenshot 8, CD officer has returned to Race HQ and is satisfied that AREN can close down operations, 90k has finished, 160k sweeper is nearly back to main Dungarvan – Waterford Road. All-in-all the day was very successful. Civil Defence were very appreciative of the information being supplied to them by us. Amateur Packet Reporting System (APRS), was used both for status updates/short messages, and, obviously for position reporting during the day. This meant that our own voice channels were kept free for more important traffic, and, in fact, very little voice traffic was passed during the day.